Here is a quick tip on how to change the Booking Windows for a resource mailbox in Exchange Server 2007. This value is set to 180 days by default and many organizations find this a bit low. My post on the same topic for Exchange 2010 can be found here! In this post I will show you how to configure the way Exchange handles work hours for a resource mailbox. 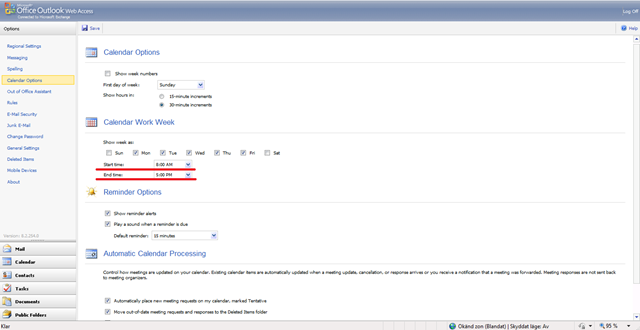 To set the work hours you can use OWA or Outlook. You can find the settings under Options and Calendar Options. Edit the Start Time and End Time of Calendar Work Week. Open the property 0x7C080102 which contains the Work Hours setting. Thanks for reading! And as usual, if you have any further questions don’t hesitate to let me know!